Meanwhile, in 1999, a few months after Riikonen left South Pole, I found myself heading to Summit Station, Greenland, for the first time. In mid-March four of us went to open the research site after a winter hiatus. Although I had seen some polar halos in Antarctica, I was totally unprepared for what I saw one day while grooming the skiway. Looking out from the Tucker I saw two halos around the sun and a variety of arcs that I had not a clue about. I stopped the machine and got out. Looking around I could see what I know now is called a parhelic circle encompassing the sky. Literally, turning around in 360 degrees I could see this halo. I started talking to myself. I said words I can’t repeat in this article! I climbed back in the Tucker but could only drive a short distance before I had to stop, get out and repeat to myself the words of absolute amazement. I didn’t know at the time how the arcs and halos formed. I don’t remember all of the individual sights I saw but that day stuck in my mind. Fast forward, this time 12 years, to 2011 and I am now spending August to November for the second consecutive year here at Summit. I have spent quite a few years working for PFS/CPS in Kangerlussuaq, which is the logistics hub for the U.S. National Science Foundation's research program in Greenland. I’ve been a frequent contributor to this blog from my photographic work there. Kanger, as we call it, has remarkable auroras but I've rarely seen halos in Kanger like those on top of the ice sheet at Summit. Marko Riikonen found my photos in 2010, after they showed up on Atoptics.co.uk and on my flickr.com site. He picked one to include in his new book on halos. He has mentored me in optical photography through this current phase here at Summit, often emailing with obvious enthusiasm. It has been a delight and inspiration having his insight and tips on photographs, as well as his explanations of the phenomena I’m witnessing and documenting. 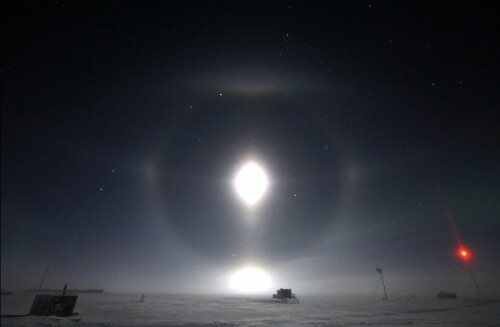 Halos and arcs can be seen worldwide, but the varied and rare phenomena mostly occur at the higher latitudes. In some remote places in the Arctic and Antarctic, scientists have to rely on the eyes (and cameras) of others. My work here at Summit Station during the early arctic winter has allowed me a unique vantage point to photograph atmospheric optics in detail, for enthusiasts and scientists such as Riikonen to gather more knowledge about them. As this correspondence has developed Riikonens’ comments have introduced me to a new vocabulary: Wegener, Schulthess and Kern arcs; Tape infralateral arcs; and all kinds of halos. Riikonen says, “When the temps fall below -30 C, you probably will get some odd radius displays, like last year.” He also says my photos have advanced the field a bit: “The Greenland ice cap halo skies have been a question mark until your photos started coming along. You have already written you name in the halo history."